We will provide additional details as we receive and process them. Below you will find links the three status of the population articles I wrote for the Monarch Watch Blog during the 2015 reproductive season. It was clear in May that the population was likely to increase significantly this year (see 6 May 2015 Monarch Population Status article). I backed off a bit in the July post (see 16 July 2015 Monarch Population Status article) due to a poor assessment of the number of monarchs moving north from 1 May to 9 June (we are working to improve this assessment with our own participants and through Journey North). By August it was clear that the earlier assessment/prediction of a significant increase was was probably going to be realized (see 6 August 2015 Monarch Population Status article). Our methods provide a means of predicting the direction of population change but our ability to predict of the magnitude of change is still at bit shy of where we need to be. But, on that note, I predicted in June that the Cape May numbers would be much lower than the long term average in 2015 – and they were. The numbers at Cape May were only about half that of the long term average. Interestingly, we had more requests for tags this year than at any time in the last five years. We suspect that the increase was due to the numbers of monarchs people were seeing in the late July – early August oviposition period. A preliminary analysis of returned tagging data sheets indicates that the taggers were more successful than in any year since 2010. Inter-annual variation is something we are going to have to deal with as best we can. Still, we have to make it clear that it’s the habitat that ultimately limits the size of the population. 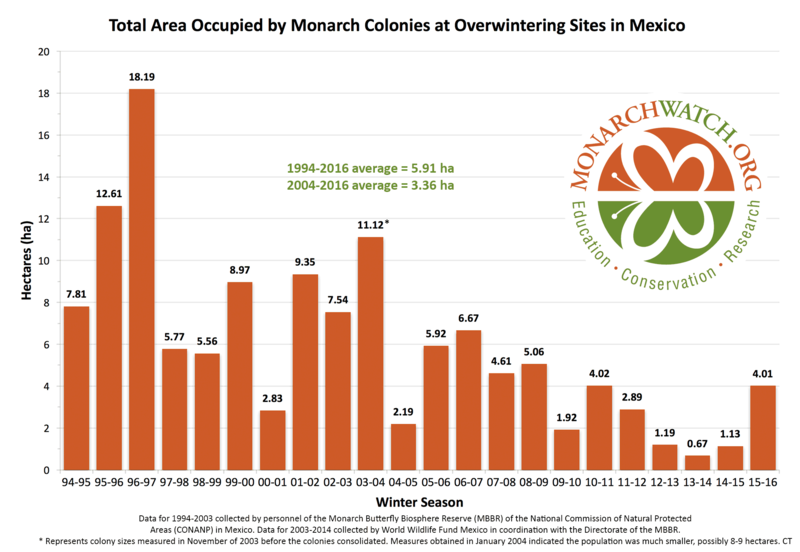 It should be clear from the variability in the hectare numbers from year to year and at a time when the habitat is decreasing by 1-2 million acres per year, that the numbers of stems it takes to get a monarch to Mexico is another variable to consider. Far fewer this year than in 2013. Based on all of the long-range forecasts, 2016 should be another good year for monarchs – if the forecasts are accurate.